The new SEDEX Model 100 LT-ELSD The SEDEX Model 100LT Low-Temperature Evaporative Light-Scattering Detector for conventional HPLC, U-HPLC and SFC allows for the detection of essentially all compounds: detection is based on a universal property of all analytes and does not require the presence of a chromophoric group, electroactive group, etc. The SEDEX Model 100LT combines the highest sensitivity, reliability, and accuracy for your analyses compared to all other aerosol-based detectors, thanks to unrivalled SEDERE low-temperature technology. This detector presents a number of outstanding innovations thereby providing the best optical and electronic benefits at a reasonable price. 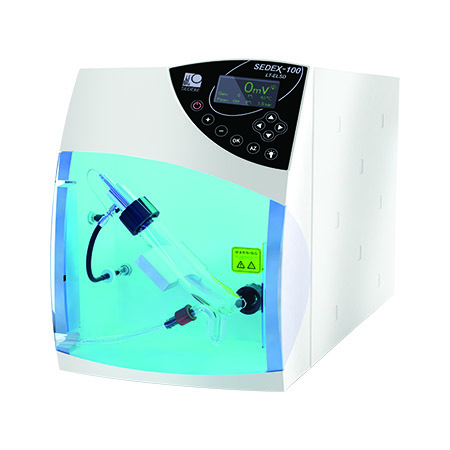 The SEDEX Model 100LT can be connected to any HPLC or SFC system, and you can control the detector locally or via a PC for a fully integrated system using a broad range of SEDEX drivers. A remote shut down mode is also provided to minimize cost and enhance system lifetime. Full SOP protocols are provided for GLP compliance and validation procedures. SEDEX Model 100 LT-ELSD provides the New Ultimate solution in Low-Temperature Evaporative Light-Scattering Detection for HPLC and U-HPLC, resulting from a New Optical Head design based on a new Laser. This detector shows a number of innovative features including the ability to select the best nebulizer and a unique new generation Low-Temperature Technology. The evaporation drift tube design optimizes both efficiency and sensitivity. In addition, you can control the system locally or via a PC thanks to drivers. A remote shut down mode is provided to minimize consumable cost and enhance system lifetime. New generation design for low-temperature evaporation of the mobile phase: optimizes sensitivity of thermally labile and semi-volatile compounds. New optical head design based on a new high power laser: provides the highest signal-to-noise ratio for all compounds. Enhanced sensitivity using digital signal treatment: an innovative signal processing algorithm minimizes noise and optimizes sensitivity. Direct dynamic range of over five orders of magnitude: With SAGA (SEDEX Automated Gain Adjustment), an innovative gain control available when it is driver-controlled by software, SEDEX Model 100LT automatically adapts the gain setting to avoid any off-scale saturation of the detector: enhanced determination of very low percentage of impurities. Direct linearity on the global dynamic range: enhanced correlation coefficients. Minimized band broadening due to an innovative cell design and a wide choice of nebulizers. Four nebulizers are available to optimize your applications. Nebulizers cover a wide flow rate range from a few μL/min to several mL/min, in addition there is a nebulizer optimized for U-HPLC and a nebulizer specifically optimized for SFC. These nebulizers can be easily changed to meet the specific requirements of the application. In addition, all parts of SEDEX Model 100LT are designed to provide the lowest dispersion, so that the observed peak widths are similar to those obtained with the most advanced UV/Vis detectors (typically below 1 second in U-HPLC). Complete Remote Control: gas, heater, photo-detector and light source can be automatically switched off at the end of a series of analyses.